New biomaterials capable of acting as three-dimensional frameworks to enable cell migration, angiogenesis, new extracellular matrix deposition, mineralization, and regeneration of this tissue have been developed., Those composed of calcium phosphate are widely used, mainly hydroxyapatite (HA), due to their similarity to the components of the bone mineral phase. However, in general, HAs used clinically are nonbioabsorbable and remain at the site of implantation for extended periods, which limits bone regeneration. It occurs because of the heat treatment at high temperatures, leading to a high crystallinity material losing the nanometric characteristics. The biological apatite has in its composition nanometric crystals as well as different ionic substitutions. The biological apatite has in its composition nanometric crystals as well as different substitutions, such as carbonate (CO3), strontium (Sr 2+), iron (Fe −), magnesium (Mg 2+), and zinc (Zn 2+) among others; further, it has low crystallinity and fast bioabsorption. In this line of research, the carbonated HA microspheres (cHAMs) mimic the biological apatite of the bone ,,,, and the objective of this study was to evaluate bone repair of this material comparatively with cHA without metals, specifically to evaluate histologically and histomorphometrically. This study hypothesized that the incorporation of metals in the structure of the HA could improve the biological response after the implantation in rats' calvaria. 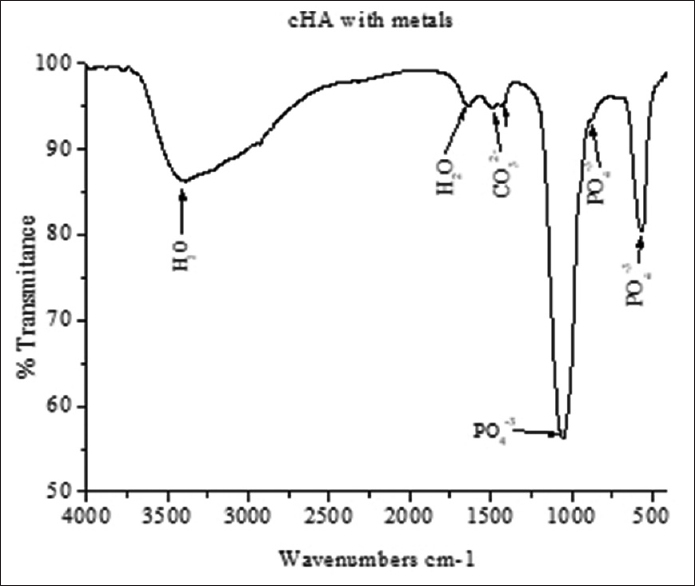 In this study, 425–600 μm microspheres composed of nanostructured cHA containing sodium alginate prepared by a wet precipitation method and containing 6 wt % CO3, with stoichiometry ranging between 1.6< Ca and P < 2.0, were synthesized and characterized in the Biomaterial Laboratory of the Brazilian Center for Physics Research. 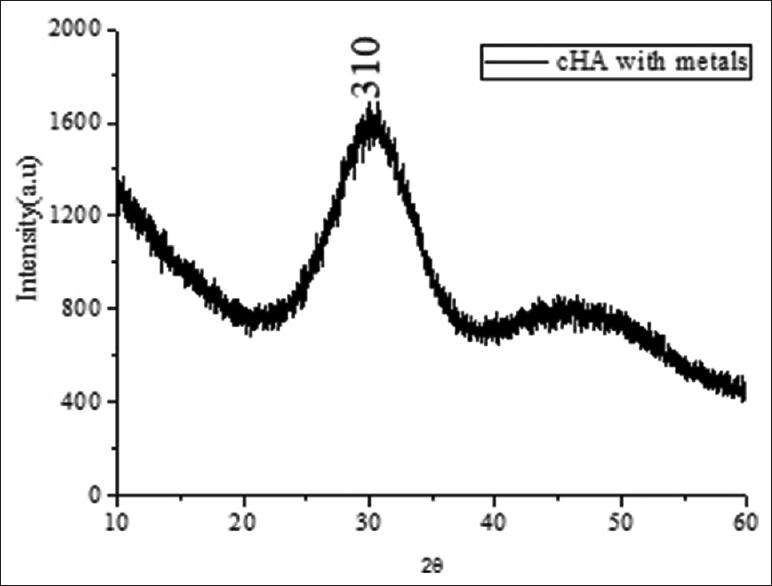 The cHA was synthesized at 37°C without receiving heat treatment (not sintered), thus maintaining their nanoscale features. The composite material used in this study is constituted by the association of cHA to the biopolymer sodium alginate in the form of microporous microspheres containing metals. The cHA was synthesized according to good standard manufacturing practices with preparation parameters that of a nanostructured material with a high specific area (>200 m 2/g), low degree of crystallinity, and reduced particle size (d < 20 nm). The syntheses carried out were based on the work of NOUNAH (1993) using calcium nitrate solutions and nitrate of the following metals: strontium, zinc, iron, manganese, and magnesium (with, respectively, 5%, 5%, 1%, 5%, and 5%), dibasic ammonium phosphate and ammonium. The anionic substitution of the (PO4) 3− by (CO3) 2− (Ca10−x [PO4]6−x [CO3]x) (OH)2-x−2y (CO3)y(0 ≤ x ≤ 1.1, 0 ≤ y ≤ 0.2) produces a material with stoichiometry very close to the mineral phase of the biological apatite increasing the biomaterial bioreabsorption in vivo. Inside the reactor the solution containing the anions: (PO4)3- + (CO3)2- were under agitation at 37°C with pH 9. On the outside there was a bottle where it was dissolved all the salts with the metals (cationic solution) pH 5. To mix the two solutions it was used the peristaltic pump with a flow of 10mL/min and mechanical agitation of 240rpm; to maintain the system at pH 9, it was used another peristaltic pump which adds NH4OH; After this addition, it was kept the material under constant agitation and temperature for 4h. Then the solid formed was removed from the reactor, filter and wash until pH7. After dripping the mixture, it remained indigestion for 24 h under the same conditions and then filtered through Buckner's funnel and resuspended in MilliQ water at 37°C until to obtain pH 7.0 in the wash water. The solid obtained was lyophilized for 24 h. The solid was macerated and separated using a sieve with <74 mm mesh opening. After synthesis, the final biomaterial formula that was used in this study was Ca7.84 Sr0.5 Zn0.5 Fe0.1 Mn0.5 Mg0.5(PO4)5.88 (CO3)0.12 (OH)2. The cHA with cationic modifications was prepared with stoichiometry ranging Ca/P = 1.25, containing 3.52 de Zn 2+; 2.46 de Sr 2+; 0.78 de Mg 2+; 2.65 de Mn 2+; and 0.45 de Fe 2+. cHA was prepared from homogeneous mixtures of the biomaterials with sodium alginate dissolved in aqueous solution. The solution gel electrophoresis of HA/alginate was dripped by extrusion method in chloride solution of calcium for 24 h for the formation of the spherical morphology of the compound and complete ionic Na + by Ca 2+, collected by filtration, and then washed with distilled water. Then, part of the microspheres was heated at 50°C for 24 h for the elimination of water. After all, microspheres with a mean diameter between 400 and 650 μm were obtained. Before the implantation in the rat's calvaria, the vibrational spectroscopy with Fourier-transformed infrared (Prestige 21, Schimadzu) [Figure 1] was performed to determine the chemical groups present, while the crystalline mineral phases present in the samples and their crystallinity were examined by X-ray diffraction (CuKa Radiation, ZeissHZG4) [Figure 2]. The biomaterials were packaged and sterilized by gamma irradiation (15 kGy/sample – Cobalt 60 irradiator at a dose rate of 19.72 Gy/min for 760 min). This project was approved by the Ethics Committee on Animal Use of Fluminense Federal University number 834/16, and the procedures performed followed the CONCEA guidelines of euthanasia practice. Thirty male Wistar rats of both genders and weighing between 300 and 400 g were distributed into two groups of 15 animals each distributed over experimental periods of 30,90, and 180 days. Each group was distributed into three subgroups of five individuals for each biomaterial and experimental period. The rats were operated under general anesthesia and received as an anesthetic medication a 0.5 ml solution of xylazine 2% (10 mg/kg, Sedazine ®, Fort Dodge, USA), 1.0 ml ketamine 10% (100 mg/kg, Francotar ®, Virbac, São Paulo, Brazil), 0.6 ml 5% midazolam (5 mg/kg, Midazolam ®, Medley, Campinas, São Paulo, Brazil), and 0.2 ml of tramadol 50 mg/ml (2 mg/kg, Tramal ®, Pfizer, Guarulhos, São Paulo, Brazil) diluted in 8.5 ml of sterile 0.9% saline solution (KabiPac ®). Each animal was anesthetized with 1 mL per 100 g of this solution intraperitoneally. After noting the absence of pain reflexes, trichotomy and antisepsis of the calvaria were performed. A semilunar incision was made on the calvaria of each animal. After the incision and subperiosteal detachment, a surgical defect was created using an 8-mm internal diameter trephine drill at intermittent low speed (1200 rpm) coupled to a 16:1 handpiece and microelectric motor with profuse irrigation with 0.9% sodium chloride. The critical size defects created were filled with around 1 g of the biomaterials according to their experimental groups. After filling the defect with cHA or cHAMs, the skin was sutured in a single plane with simple interrupted sutures with mononylon 5.0 (J and J Ethicon ®, São Paulo, Brazil). The wounds were left uncovered, and all animals received anti-inflammatory medication by intramuscular injection of a single dose of Maxicam ® 1 mg/kg (Ourofino Pet, Cravinhos, SP, Brazil). For recovery from anesthesia, the animals were returned to the cages and received food and water ad libitum. After 30, 90, and 180 days and without presenting any inflammatory signs in the operated area, the animals were euthanized with an overdose of general anesthetic (Thiopentax ®, 150 mg/kg; Cristália, São Paulo, Brazil) and the bone blocks were obtained. Thirty samples were decalcified and embedded in paraffin, sliced into serial sections of 5 μm thickness transverse to the plane of the implant, and then stained with hematoxylin and eosin. The slides obtained from the decalcified blocks were observed with light microscopy, and images were captured with a digital camera. A descriptive analysis of the tissue response to the biomaterials was performed due to the presence of connective tissue and newly formed bone in the defects beyond the resorption of the biomaterials. The histomorphometric evaluation was performed using Image-Pro Plus ® 6.0 (Media Cybernetics, Silver Spring, MD, USA). Quantitative records of this information were stored in a database developed in Microsoft Excel ® spreadsheet software and transferred to Prism ® 6.0 software (GraphPad Software, Inc., CA, USA) for statistical analysis. The averages found were analyzed statistically by the D'Agostino and Pearson analysis. Outliers were removed using the Rout equation with a value of Q = 1%. After the Kruskal–Wallis test and posttest of multiple Dunn's comparisons, significant differences were observed for P < 0.05. Statistical analysis of experimental and control groups was performed by comparing the amount of area of newly formed bone and connective tissue in the critical defect and the presence of the remaining biomaterial for each experimental period. At 1 month, small particles of biomaterial were observed, sometimes enclosed by multinucleated giant cells, presence of fibrocellular connective tissue, moderate mononuclear infiltrate, and presence of congestive vessels. On the margins of the defect, the presence of neoformed bone tissue toward the center of the defect [Figure 3]. At 3 months, small particles of the biomaterial were present, surrounded by multinucleated giant cells, areas of neoformed bone involving biomaterial, interspersed with connective tissue showing areas of moderate inflammatory infiltrate with a predominance of macrophages in their totalized foam. A greater amount of neoformed bone was observed on the margin of the defect. At 6 months, the area of the defect was filled with connective tissue showing foci of moderate inflammatory infiltrate with a moderate amount of foamy macrophages, absence of giant cells, and minimal presence of neoformed bone. The presence of neoformed bone is observed in the distal extremities. After 1 month of implantation, the area of the defect is filled with connective tissue showing fragmented biomaterial particles and a large amount of macrophagic infiltrate (foamy macrophages). Little neoformed bone is seen at the center of the defect and the extremities. The presence of multinucleated giant cells was observed. After 3 months of implantation, the defect is filled with connective tissue showing a moderate amount of neoformed bone from the periphery to the scarcely inflammatory infiltrate center. After 6 months of implantation, a defect filled by a delicate band of connective tissue, scarce inflammatory infiltrate, and presence of neoformed bone in the periphery of the defect toward the center and islets of neoformed bone close to the periphery of the defect is observed. After histomorphometric evaluation, we observed a statistically significant difference between the cHA and cHAM groups after 1 month of implantation (P < 0.05); however, when compared between 1 and 3 months and between 1 and 6 months for the cHAM group, there was a statistically significant difference (P > 0.05). In cHA group between the periods of 1 and 3 months and between the periods of 1 and 6 months, there was no statistical difference (P > 0.05). After 3 months of implantation in the cHAM group, we observed that when compared to the cHA group, there was a statistically significant difference (P < 0.01), but when the two groups were compared after 6 months of implantation, there was no significant difference. When comparing the periods between 3 and 6 months for both groups, there was no statistical difference (P > 0.05) [Figure 4]. After 1 and 3 months between the two groups, cHA and cHAM, there was a statistical difference (P < 0.01); however, after 6 months of implantation, there was no statistical difference (P > 0.05). When comparing within month group (cHA) between the periods of 1 and 3 months and between the periods of 1 and 6 months, no statistically significant difference was observed (P > 0.05). In the cHAM group between the periods of 1 and 3 months, there was no statistically significant difference (P > 0.05), but between the periods of 1 and 6 months, there was a difference (P < 0.01). Between the two groups after 1 month of implantation, a statistically significant difference was observed (P < 0.001). After 3 and 6 months, the statistically significant difference between the groups was also observed (P < 0.0001). Within the cHA group between the periods of 1 and 3 months and between the periods of 1 and 6 months, there was no statistical difference (P > 0.05). In the cHAM group between the periods of 1 and 3 months and between 1 and 6 months, there was no statistical difference (P > 0.05). To develop the in vivo experiment as efficient and ethical as possible, the test material was previously analyzed in in vitro studies to confirm its cytocompatibility and to avoid adverse responses in the animals. It has been demonstrated, therefore, that the biomaterial is as cytocompatible as the control material being feasible for its animal experimentation. Biomaterials are the most studied option for bone repair as they are seen as a viable possibility for the replacement of autogenous grafts. Among the various biomaterials, calcium phosphates are distinguished by properties such as biocompatibility, osteoconduction, and bone neoformation. Cationic and anionic substitutions in calcium phosphates have been reported in the literature as an alternative to mimicking the biological apatite of the bone tissue that contains trace elements. The present study incorporated cationic substitutions to the cHA (zinc, strontium, manganese, magnesium, and iron) to obtain improvements in its properties since it aims to obtain similarities ever closer with the natural HA present in the inorganic part of the human bone. Previous studies incorporating zinc exclusively into calcium phosphates found that the presence of zinc improved bone repair , while other studies have shown that there was no difference when compared to nonzinc materials. However, in a systematic review, Cruz et al. evaluated that the zinc concentration may influence this repair of 7%–8% more. Previous studies using magnesium reported that once incorporated into the biomaterial, it provided an improvement of 4–5 times regarding bone repair when compared to the clot control group. Manganese and iron were incorporated into the test material to simulate the biological apatite, but no previous studies have used these metals incorporated into calcium phosphate. In this study, we did not observe improvement in the bone repair with metals containing cHA. The association of each ion to biomaterials showed to help in bone neoformation as shown in some studies; however, when adding all ions together, these results become negative as shown in the present study. From the results obtained, it is understood that HA carbonated at 37°C with ionic substitutions showed a greater amount of connective tissue and consequently less neoformed bone when compared to the control group. There was also a low biomaterial presence in the two test and control groups during the three experimental periods, which may demonstrate that its reabsorption occurred rapidly. In the control group, this was replaced by bone tissue, whereas in the test group, this substitution did not characterize bone neoformation, but rather the formation of more connective tissue. A possible explanation for the different results is the fact that the test material is unstable in organic place and may have been reabsorbed before the time to perform its function in the tissue place. It was concluded that the nanostructured cHAs with cationic substitutions are biocompatible, but very reabsorbable, and therefore, they have low osteoconductive potential while nanostructured cHAs synthesized at 37°C without cationic substitutions are bioactive biomaterials that have optimal activity and biocompatibility and can be used as a bone substitute. Carmo AB, Sartoretto SC, Alves AT, Granjeiro JM, Miguel FB, Calasans-Maia J, et al. Alveolar bone repair with strontium-containing nanostructured carbonated hydroxyapatite. J Appl Oral Sci 2018;26:e20170084. Calasans-Maia M, Calasans-Maia J, Santos S, Mavropoulos E, Farina M, Lima I, et al. Short-term in vivo evaluation of zinc-containing calcium phosphate using a normalized procedure. Mater Sci Eng C Mater Biol Appl 2014;41:309-19. Costa NM, Yassuda DH, Sader MS, Fernandes GV, Soares GD, Granjeiro JM. Osteogenic effect of tricalcium phosphate substituted by magnesium associated with genderm® membrane in rat calvarial defect model. Mater Sci Eng C Mater Biol Appl 2016;61:63-71. Pina S, Oliveira JM, Reis RL. Natural-based nanocomposites for bone tissue engineering and regenerative medicine: A review. Adv Mater 2015;27:1143-69. Fazzalari NL. Bone fracture and bone fracture repair. Osteoporos Int 2011;22:2003-6. Heithersay GS, Kahler B. Healing responses following transverse root fracture: A historical review and case reports showing healing with (a) calcified tissue and (b) dense fibrous connective tissue. Dent Traumatol 2013;29:253-65. Stegen S, van Gastel N, Carmeliet G. Bringing new life to damaged bone: The importance of angiogenesis in bone repair and regeneration. Bone 2015;70:19-27. Miguel FB, Barbosa Júnior Ade A, de Paula FL, Barreto IC, Goissis G, Rosa FP. Regeneration of critical bone defects with anionic collagen matrix as scaffolds. J Mater Sci Mater Med 2013;24:2567-75. Lavine M, Frisk M, Pennisi E. Biomaterials. Introduction. Science 2012;338:899. Daw R, Tonzani S. Biomaterials. Nature 2009;462:425. Oliveira HL, Da Rosa WL, Cuevas-Suárez CE, Carreño NL, da Silva AF, Guim TN, et al. Histological evaluation of bone repair with hydroxyapatite: A systematic review. Calcif Tissue Int 2017;101:341-54. Resende RF, Fernandes GV, Santos SR, Rossi AM, Lima I, Granjeiro JM, et al. Long-term biocompatibility evaluation of 0.5% zinc containing hydroxyapatite in rabbits. J Mater Sci Mater Med 2013;24:1455-63. Rajabi-Zamani AH, Behnamghader A, Kazemzadeh A. Synthesis of nanocrystalline carbonated hydroxyapatite powder via nonalkoxide sol-gel method. Mater Sci Eng C 2008;28:1326-29. Boanini E, Gazzano M, Bigi A. Ionic substitutions in calcium phosphates synthesized at low temperature. Acta Biomater 2010;6:1882-94. Aina V, Lusvardi G, Annaz B, Gibson IR, Imrie FE, Malavasi G, et al. Magnesium- and strontium-co-substituted hydroxyapatite: The effects of doped-ions on the structure and chemico-physical properties. J Mater Sci Mater Med 2012;23:2867-79. Guo DG, Hao YZ, Li HY, Fang CQ, Sun LJ, Zhu H, et al. Influences of Sr dose on the crystal structure parameters and Sr distributions of Sr-incorporated hydroxyapatite. J Biomed Mater Res B Appl Biomater 2013;101:1275-83. Valiense H, Barreto M, Resende RF, Alves AT, Rossi AM, Mavropoulos E, et al. In vitro and in vivo evaluation of strontium-containing nanostructured carbonated hydroxyapatite/sodium alginate for sinus lift in rabbits. J Biomed Mater Res B Appl Biomater 2016;104:274-82. Kabir H, Nigar F, Ahmed S, Kabir SF, Mustafa AI, Ahsan M. Fluoride doped bioceramic from egg shell: A promising biomaterial for bone tissue engineering. Trends Biomater Artif Organs 2013;27:182-3. Ito A, Kawamura H, Otsuka M, Ikeuchia M, Ohgushi H, Ishikawa K, et al. Zinc-releasing calcium phosphate for stimulating bone formation. Mater Sci Eng C 2002;22:21-5. Combes C, Rey C. Amorphous calcium phosphates: Synthesis, properties and uses in biomaterials. Acta Biomater 2010;6:3362-78. Li ZY, Lam WM, Yang C, Xu B, Ni GX, Abbah SA, et al. Chemical composition, crystal size and lattice structural changes after incorporation of strontium into biomimetic apatite. Biomaterials 2007;28:1452-60. Shepherd D, Best S. Production and characterization of zinc substituted hydroxyapatite. Key Eng Mater 2008;361-363:159-62. Yamaguchi M. Role of nutritional zinc in the prevention of osteoporosis. Mol Cell Biochem 2010;338:241-54. Habibovic P, Juhl MV, Clyens S, Martinetti R, Dolcini L, Theilgaard N, et al. Comparison of two carbonated apatite ceramics in vivo. Acta Biomater 2010;6:2219-26. Kneser U, Schaefer DJ, Polykandriotis E, Horch RE. Tissue engineering of bone: The reconstructive surgeon's point of view. J Cell Mol Med 2006;10:7-19. Matsuno T, Hashimoto Y, Adachi S, Omata K, Yoshitaka Y, Ozeki Y, et al. Preparation of injec[table 3]D-formed beta-tricalcium phosphate bead/alginate composite for bone tissue engineering. Dent Mater J 2008;27:827-34. Cruz R, Calasans-Maia J, Sartoretto S, Moraschini V, Rossi AM, Louro RS, et al. Does the incorporation of zinc into calcium phosphate improve bone repair? A systematic review. Ceram Int 2018;44:1240-9. Sun TW, Yu WL, Zhu YJ, Chen F, Zhang YG, Jiang YY, et al. Porous nanocomposite comprising ultralong hydroxyapatite nanowires decorated with zinc containing nanoparticles and chitosan: Synthesis and application in bone defect repair. Chemistry 2018;24:8809-21. Landi E, Sprio S, Sandri M, Celotti G, Tampieri A. Development of Sr and CO3 co-substituted hydroxyapatites for biomedical applications. Acta Biomater 2008;4:656-63.